Awhile back, I talked about how I recorded two songs with David Lichtenstein. It’s funny. I’ve always thought it must be tough being the child of someone famous. You’re always living in their shadows. People will often compare you to them. For instance, I’d hate to be Walter Payton’s or Barry Sander’s sons. I of course wish them the best and hope they’re happy. But could you imagine what it would be like if your father was arguably the best player at his position of his generation? People will compare you, whether you’d like them to or not. David though went an entirely different route. He got into music instead. He’s got a fat studio in Oakland, and if you’re recording any music and can afford that studio, you may want to look him up. Super nice guy! I don’t remember the gallery name. But the very first time I saw his work, I admired it. No, not loved it. Admired it. Two completely different feelings. I admired his work because it’s so grand. 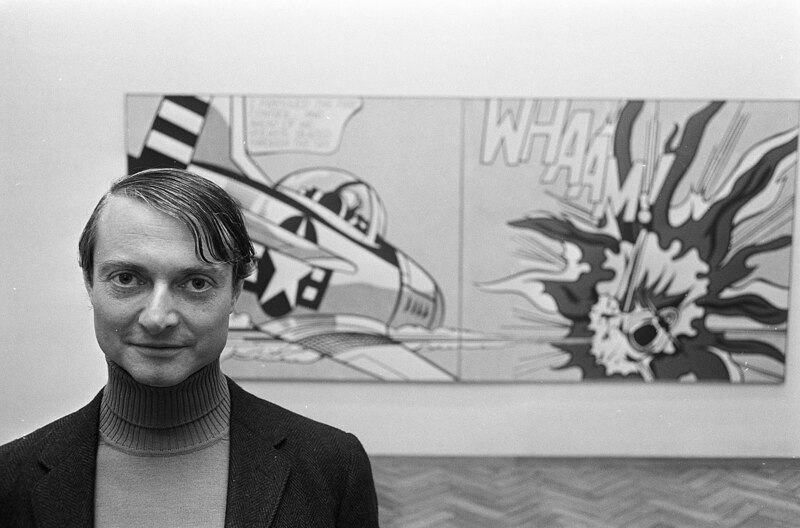 The cover image is of Roy Lichtenstein back in 1967. Credit to Eric Koch for Nationaal Archief for the photograph. Anyways, it’s grand. It’s big. And it works. Some folks hated it as pop art. I get it. But, it works. Photos don’t give it justice. You have to see it in person. I’ve seen a lot of art over the years. I’ve also bought a lot of art over the years. I forget almost everything I’ve seen. I’ve even forgot about pieces I’ve purchased. If I remember your work, that’s a huge compliment. I’ll always remember Lichtenstein’s work. It’s funny. I’m always hearing from kids that their parents try to discourage them from taking art seriously. I think that’s the most stupid thing you can do to your kid. So you’re worried about money? Well, hate to break it to you. Unless you’re a nurse or a doctor, there’s no job security. Even highly coveted jobs now may become obsolete in a decade or two. You might as well do something you love. But then, to rub it in their faces, I talk about how I recorded two songs with David Lichtenstein. And I tell them how much their paintings are worth. Masterpiece recently sold for $165 million. That makes six paintings over $40 million. That’s a lot of money. Not that I’m even trying to make that much. Yeah, I hope after I’m dead, my paintings go for insane amounts. I’m just throwing that out there. I’ve seen the featured painting in real life. So yes, in this Artists I like series, I definitely want to throw Roy Lichtenstein’s name in the ring.